What is the difference between 17-4 and 316L stainless steel? Stainless steel (SS) comes in all shapes, sizes, and compositions. It’s an alloy comprised of several different elements such as iron, nickel, and chromium with superior corrosion resistance compared to its constituent parts. Different applications require different material properties. In fact, there are dozens of individual grades of stainless steel alone, each with a unique proportion of ingredients and application benefits. This article will focus on two types in particular: 17-4 and 316L stainless steel. 17-4 stainless steel, also known as SAE Type 630, is a common and exceptionally durable type of steel used in a diverse variety of industries and applications. 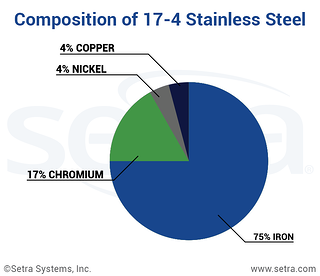 The numbers “17-4” refer to its composition: ≈17% chromium and ≈4% nickel. It also can include between 3 and 5% copper. It is the most common material used in the production of Setra’s variable capacitance transducers. Its durability and mechanical properties make 17-4 SS the ideal choice for transducers in both HVAC and general industrial applications. 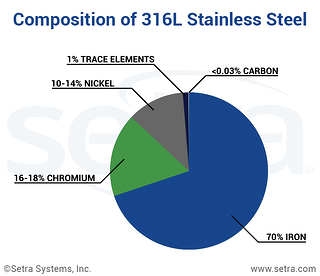 316L stainless steel is defined by its low carbon content: no more than 0.03% carbon. In general, its composition is between 16-18% chromium and between 10-14% nickel (as well as trace amounts of manganese, silicon, phosphorus, sulfur and nitrogen). The number 316 refers to a reference number assigned by SAE International, a standards organization that serves the automotive and aerospace industries. 316L SS is favored in many industrial applications for its resistance to corrosion, especially when in prolonged contact with hydrogen. 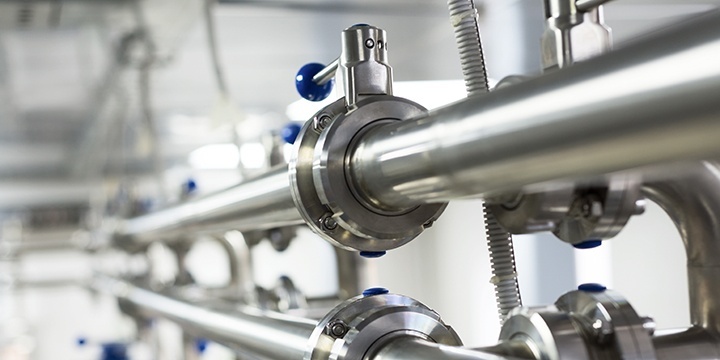 Hydrogen is used as a process medium across many different applications and can cause other materials to deteriorate over time — a process called hydrogen embrittlement. Hydrogen embrittlement can cause the process media to leak into the immediate environment and pose serious safety and contamination risks. 316L SS is resistant to hydrogen embrittlement, making it the standard wetted material used in pressure transducers, such as the Setra Model AXD, that use hydrogen and other corrosive gases as process media. CLICK HERE to learn more about the importance of material compatibility between 17-4 and 316L stainless steel. 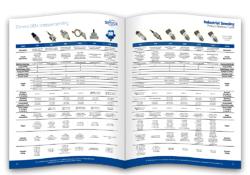 Choosing the right pressure transducer just got easier. This guide makes finding the exact right solution for your application simple and easy!